Air California (OC) was the idea of five local Orange County businessmen (William Myers, Alan Kenison, Mark Gates, William Pereira and Lud Renick) who met in December of 1965, in Corona del Mar to discuss the possibility of forming an airline to fly between the Orange County region and San Francisco. Orange County during that time was a rural region south of metropolitan Los Angeles where agriculture fields and orange orchards stretched for miles. The Orange County-Santa Ana airport with a single runway, was located southwest of Santa Ana on Irvine Ranch. 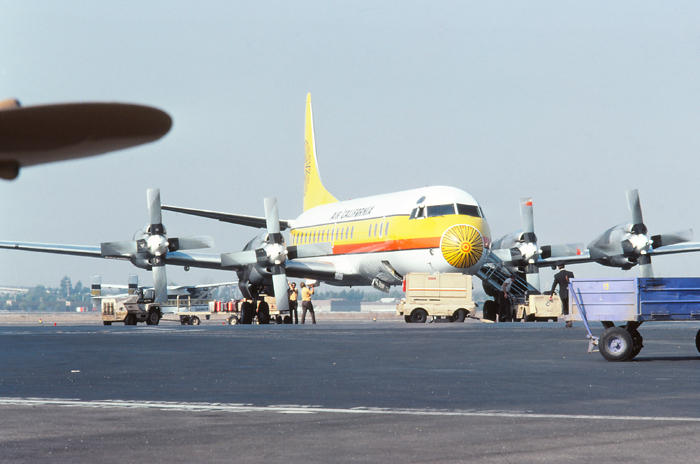 Small towns dotted the area and Orange County had only one airline serving the airport in 1965, Bonanza Airlines which connected the airport directly to Los Angeles, San Diego, and Ontario with their Fokker F-27 "Silver Dart" aircraft. Flights to any other city would require connections through Bonanza or the sometimes tedious drive north forty miles to Los Angeles International Airport. With the area surrounding the airport slowly growing and the opening of tourist attractions, Disneyland and Knott's Berry Farm just to the north, the five business men figured Orange County was destined for its own hometown airline to support the new passenger demand. In April 1966, Air California filed a route application for intra-state operations with the California Public Utilities Commission which granted approval in September 1966. 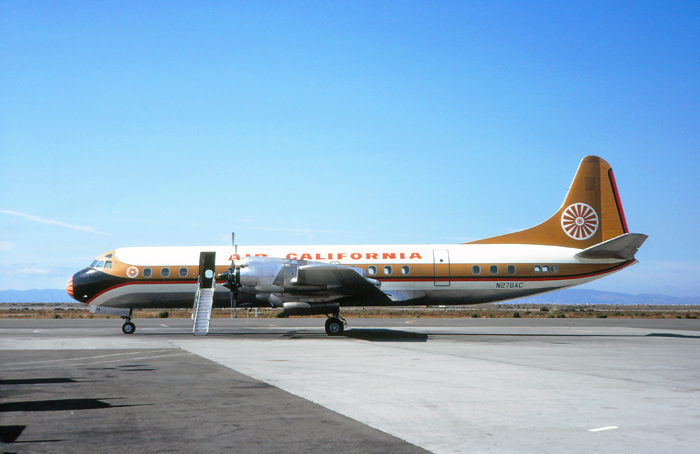 Having acquired two Lockheed Electra prop-jet airplanes, Air California started five daily flights between Orange County and San Francisco on January 16, 1967. Later that year in October, with the addition of two more Electra's, Air California started additional service from Orange County to San Jose and Oakland both in the Bay Area supplementing the initial San Francisco services. In an effort to compete with mainline jet service flying into San Francisco from the Los Angeles region, Air California leased two Douglas DC-9 airplanes from Douglas Corporation in March 1968. The new jet airplanes were used on the Orange County to San Francisco route specifically to better compete with passenger demands while the Electra's were transferred over to the other two city pairs. With both passenger numbers and revenues climbing, Air California decided to lease four Boeing 737-200 aircraft for delivery in the fall of 1968, to replace the Douglas DC-9s and allow "jet" service to the Bay Area to increase. The 737s were leased from GATX which had four aircraft readily available when Pacific Air Lines canceled their order for the planes due to the pending merger into AirWest. The first 737 flight was on October 7, 1968, from Orange County to San Francisco and two weeks later Ontario, California was added to the schedule with 737 flights to both San Jose and Oakland. By the end of 1969, the desert resort location of Palm Springs was added as new destination with direct flights to the three Bay Area airports. 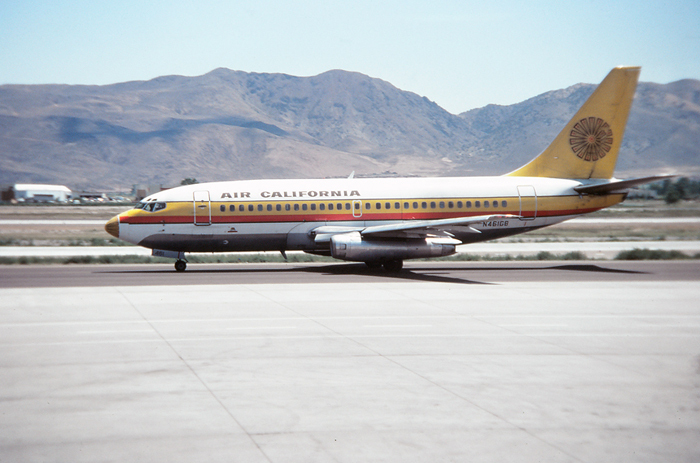 By 1970, Air California had established itself as a solid carrier from Orange County and with its success in the Bay Area, had caused intra-state competitor Pacific Southwest Airlines (PSA) to become concerned. In May 1970, PSA placed a bid to acquire Air California, however with the help of a strong employee base firmly against the take over, the California Public Utilities Commission ruled against the potential acquisition stating that a second airline within California created healthy competition that was a benefit to the traveling public. That same year, Westgate-California, an investment firm, assumed control of Air California through purchase of common stock and accepted delivery of its first purchased Boeing 737-200 in September, bringing the total fleet to seven 737 airplanes. San Diego was added to the route network on November 1, 1970, with six daily flights to both Oakland and San Jose. A year later in November 1971, the State Capitol, Sacramento was added as the eight California city to be served by the airline. Throughout the early 1970s the numerous orange groves and strawberry fields surrounding the Orange County airport region slowly disappeared and made way for subdivisions and shopping malls. 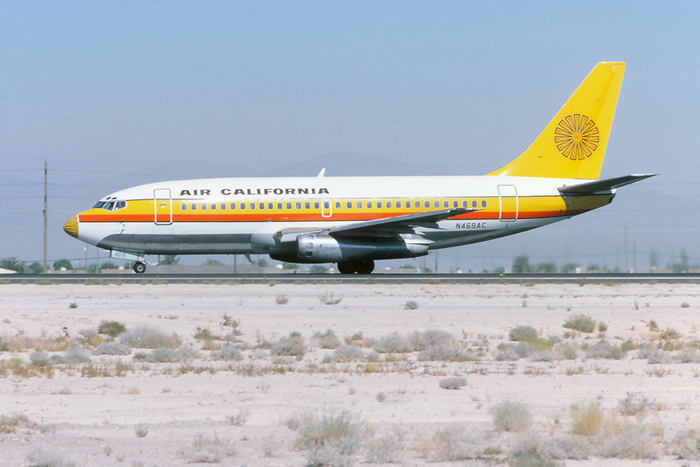 Air California continued to reaming strong and carried over 1 million passengers during the year of 1972. The airline continued to seek new cities in the state to serve and in February 1975, was granted authority to fly passenger services into South Lake Tahoe Airport. Lake Tahoe was located in the Sierra Nevada mountains and was both a summer and winter resort area for California and Nevada residents. The airport, at an elevation over 5,000 feet and located in a rather narrow canyon landscape, was considered one of the most difficult to operate from in the United States. The airport had placed a ban on jet-aircraft so the now somewhat obsolete Electra's were pressed back into service to connect Lake Tahoe with San Francisco, San Jose, Oakland, and Orange County. 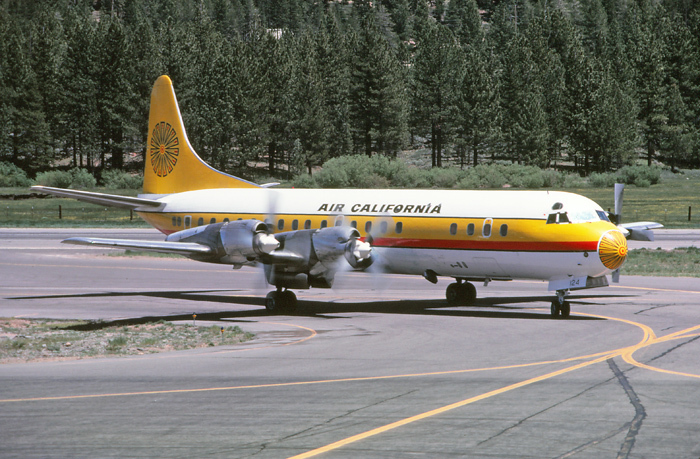 As one of the only airlines to serve the airport, the route became quite popular, enough so that Air California had to lease an additional Lockheed Electra in April 1975, to supplement the service. In September 1975, Air California purchased the routes and certificate of failed Holiday Airlines. Holiday was established in 1965, and began flying scheduled passenger services from Los Angeles International Airport in 1967, to San Diego, San Jose, Oakland, Burbank and Lake Tahoe with two Lockheed Electra's. When the airline went bankrupt, Air California saw a perfect opportunity to grab the lucrative Lake Tahoe routes along with the additional Electra's to be used for service into the mountain resort city. Into the late 1970s Air California experienced some dramatic changes because of Airline Deregulation legislation and in 1978 filed an application with the National Civil Aeronautics Board (CAB) to extend services beyond its California borders into neighboring states. The first routes applied were for service in the State of Nevada, specifically to both Reno and Las Vegas from various California cities. If approved, the new routes would make Air California a true inter-state carrier. The airline also purchased two more Boeing 737s and in 1978, started service to both Fresno and Monterey, California. In 1979, the airline completed two major milestones; with approval from the CAB, the start of service to Reno, Nevada in January, followed by Las Vegas in September and the announcement of the ordering of seven McDonnell Douglas MD-80 aircraft. The new MD-80s would be utilize "new aircraft" technology enhancing fuel efficiency and operating economics. The biggest benefit to the new planes was the "quiet" noise profile making it a welcome addition to the noise sensitive Orange County Airport. As the dawn of the 80s arrived, Air California retired its three Lockheed Electra's due to increasing maintenance costs and the resulting services to Lake Tahoe were also dropped. With the retirement of the Electra's, Air California became an all jet fleet. Another out of state city, Portland, Oregon, was added to the route map on March 24, 1980, when service was started to Reno, Oakland, and San Jose adding a vital link to the Pacific Northwest market. On July 15, 1980, the airline started service into Los Angeles International Airport (LAX), the last major airport to be added in the Southern California region. Los Angeles was was a rather large step for the carrier as competition was abound by both established regional and national carriers, including its arch nemesis PSA. Initially service to LAX was with flights to Fresno and Monterey, both cities that were considered secondary markets and had been dropped by the majors due to deregulation. These first routes would establish a firm foot-hold for the airline at Los Angeles and allow the carrier to eventually grow at the airport. By the end of 1980, almost 3 million passengers were carried for the year and the CAB re-classified the airline as a national carrier based upon its net income of over $159 million. During early 1981, Air Florida placed a bid to purchase Air California and the CAB actually granted approval for a purchase, however this was blocked by a pair of local Orange County real estate investors. Both William Lyon and George Argyros, purchased the airline from Westgate Corporation in March 1981, for $61.5 million dollars. With the purchase, came a new image and name change for the airline. Although Air California had grown to serve the "unserved and underserved" airports of California, recent and future growth patterns indicated a continued interstate presence and the current name, based on the new ownership, implied a "geographical" limitation. 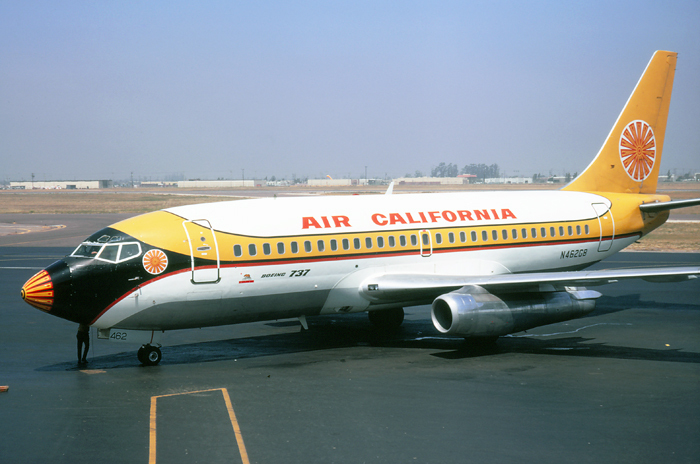 The airline was renamed AirCal and a striking new color scheme was designed to represent the colors of a California sunrise and the warmth of a new beginning for the carrier. Aircraft exteriors and interiors, flight attendant wardrobes, ticket counters and stationary would be changed to reflect the new title. The AirCal name became official on April 1, 1981, replacing the Air California that successfully placed Orange County on the air travel map. A month later, AirCal's first McDonnell Douglas DC-9-80 (MD-80) entered service on May 15, 1981, and was used to increase flights and passenger capacity from Orange County and Bay Area airports. By the end of 1981, AirCal had added two more out-of-state destinations; both Phoenix and Seattle and passenger boarding's had increased 15% over the previous year so much so that the airline was required to lease additional Boeing 737s from Aer Lingus and Aloha Airlines. 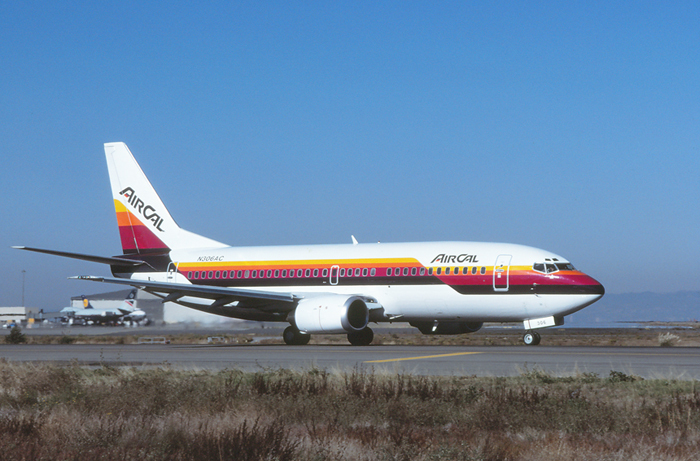 Only a year later in 1982, turned out to be a bleak year for AirCal as the rapid growth had created financial difficulties resulting in the airline dropping four cities; (Phoenix, Fresno, Las Vegas, and Monterey) and reducing its fleet of Boeing 737s by four. The airline started an aggressive marketing and advertising campaign, streamlined management and adjusted its route structure yet the airline ended the year with a loss, the first time since 1972. 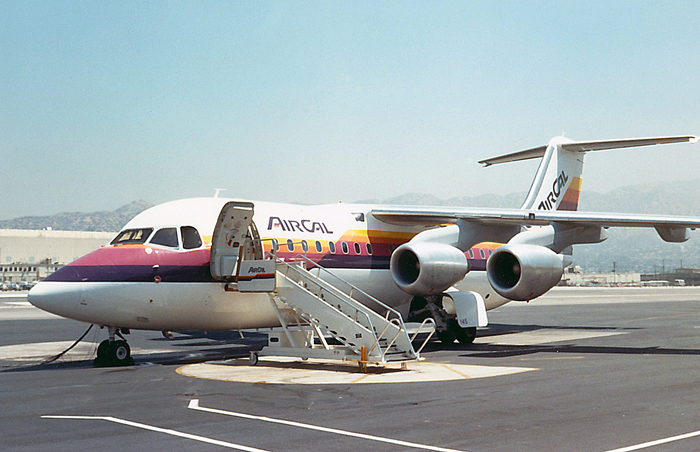 AirCal made a quick turn-around and into 1983, more focus was placed on the lucrative Southern California-Bay Area services including adding service in the fiercely competitive Los Angeles-San Francisco market. 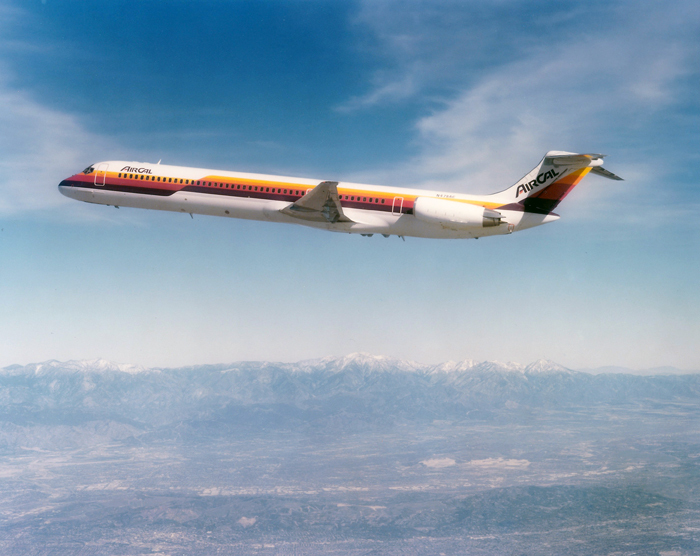 Service was restarted to Lake Tahoe from San Jose, Oakland and San Francisco using the MD-80, as the ban on jet traffic had been lifted. By the end of 1983, AirCal had fourteen Boeing 737-200s, seven MD-80s and was flying over 200 flights a day between thirteen cities. In December 1983, the airline signed a code share with Muse Air for connection of flights at Los Angeles to Texas and beyond. This agreement help extend AirCal's presence into the desert southwest and Texas markets. AirCal continued to manage its growth and decided to place an order for the new Boeing 737-300 aircraft to replace the McDonnell Douglas MD-80s. The new 300 series, was more fuel efficient then the MD-80s, quieter and would bring fleet commonality with the existing 737 fleet. The airline ordered twelve airplanes with an option for eleven more. Due to the continued growth and while waiting delivery of the new 737-300s, an additional five Boeing 737-200 were leased. As traffic grew to 12% over the previous year, AirCal was able to turn a small profit by the end of 1984. The increase in traffic was helped by the partnership with Houston, Texas, based Muse Air which started on January 1, 1984. Connecting flights using both carriers route system at Los Angeles International Airport were incorporated into each airline schedule allowing Muse Air customers to connect to AirCal's California flights and AirCal's customers to connect into Muse Air services eastbound from Los Angeles. The first Boeing 737-300 was delivered on February 1, 1985, and placed in service between both Los Angeles and Orange County and San Francisco and on flights between Portland and Seattle. Another first for the airline took place on June 1, 1985, when international services were started to Vancouver, Canada from San Jose, California. 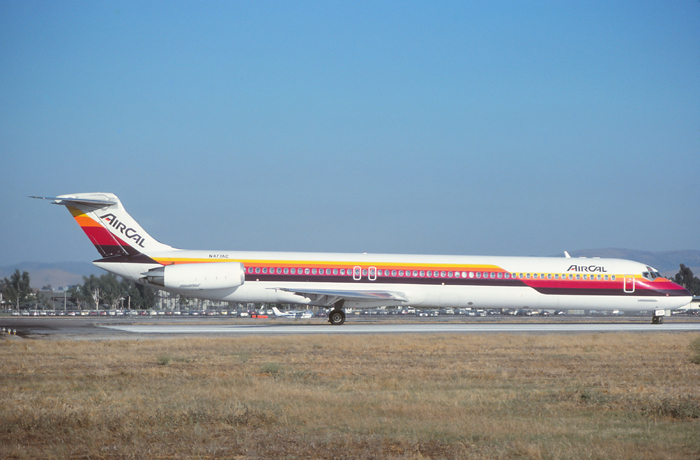 Although AirCal had been flying the occasional charter flight to Mexico from the 1970s, the Vancouver service was the first, daily scheduled passenger flight outside the borders of the United States for the airline. Heading into 1986, traffic continued to increase for AirCal and the airline continued its effort and route expansion along with steady growth. San Diego was again added to the route schedule in April, with AirCal being careful to time flights around competitor PSA on services to San Jose and introducing new service to Orange County just eighty miles to the north. In May, service was started from Seattle to Anchorage, Alaska. Although this route was heavily traveled by well established and traditional carriers such as Alaska Airlines and Western Airlines, AirCal hedged it's bets on the one-stop service between Southern California and "The Last Frontier," of Alaska. Another significant event for the Orange County hometown airline was the inauguration of non-stop service to Chicago O'Hare on July 1, 1986. The new flights operated three times a day, with the Boeing 737-300 and were the only non-stop flights between Orange County and Chicago. Although AirCal, wanted to continue adding flights from Orange County to the Bay Area and other California cities, there was limitation at Orange County Airport with available slots due to noise restrictions. The Orange County area had grown considerably, especially around the airport where rolling hills and open fields had made way for high-end subdivisions, shopping centers and high-tech industry. The Orange County airport had become landlocked and noise was a very sensitive issue to the thousands of residents that had settled in neighboring Newport Beach and Costa Mesa. To further increase its advantage at Orange County and compete with PSA, AirCal placed an order for the super-quiet British made jetliner, the British Aerospace BAe 146. Six, 85-passenger planes were ordered in early 1986, with the first being delivered on March 3, 1986. The new planes were put into service on the Orange County-San Diego route and as more BAe 146 aircraft were delivered they were placed on various shorter routes and secondary cities throughout the network such as flights from Burbank, San Jose, and Sacramento. 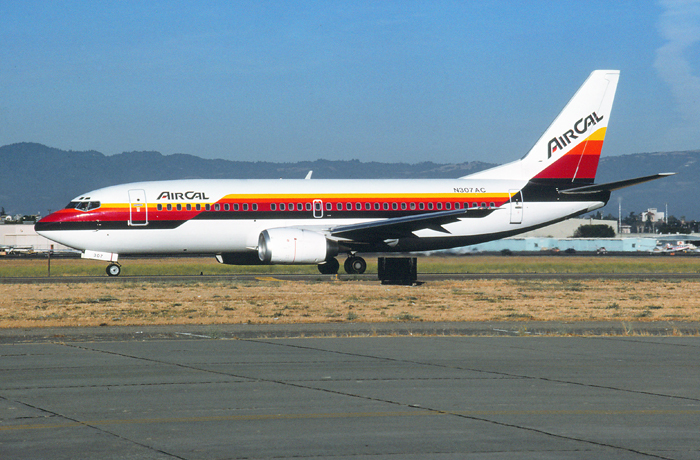 As 1986, came to a close, AirCal was operating over 300 flights a day to sixteen different cities in California, Oregon, Washington, Nevada, Alaska, and Illinois. Due to the continued popularity and strength of its signature service, the airline had to lease numerous Boeing 737-200s from various airlines or leasing agencies to cover the demand. With a vision on the future, there was even some speculation the airline was seeking Boeing 757s for possible transcontinental service from Orange County. The Orange County Airport Authority was considering allowing operations of the narrow-body twinjet. (The airport eventually allowed 757 operations in the fall of 1987). AirCal was rumored to be thinking about flights to destinations such as Montreal, Canada, Boston, New York-La Guardia, and Washington DC. Before a nationwide expansion was to be realized, another fate held the future of the carrier. During the mid-80s, major airlines were hoping to fill the void by purchasing regional airlines in an effort to secure additional gates, routes and aircraft in more lucrative markets not traditionally served by the major. AirCal was no exception and had some initial interest from USAir and Continental Airlines. Continental was especially interested as its regional west coast services were basically non-existent and a failed attempt at a regional off-shoot of Continental West did not last even a year. After various meetings, American Airlines stepped up and after American's Chairman and President Robert Crandall stated "We need an immediate presence on the West Coast," proposed a purchase worth $225 million in November 1986. 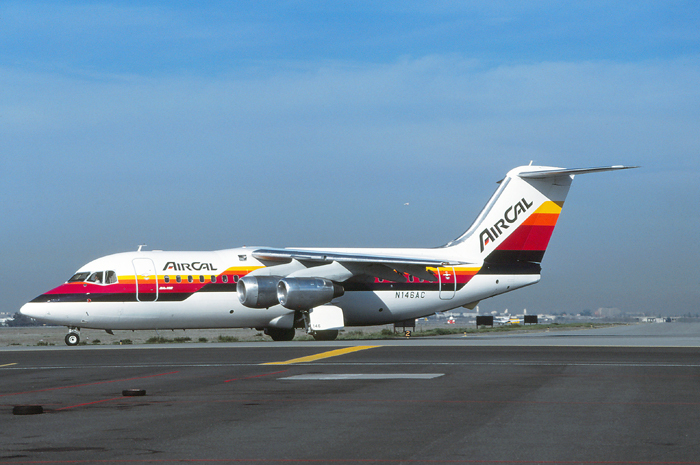 As January 1987, rolled around, AirCal celebrated its 20th anniversary, amid wild speculation of a pending sale. 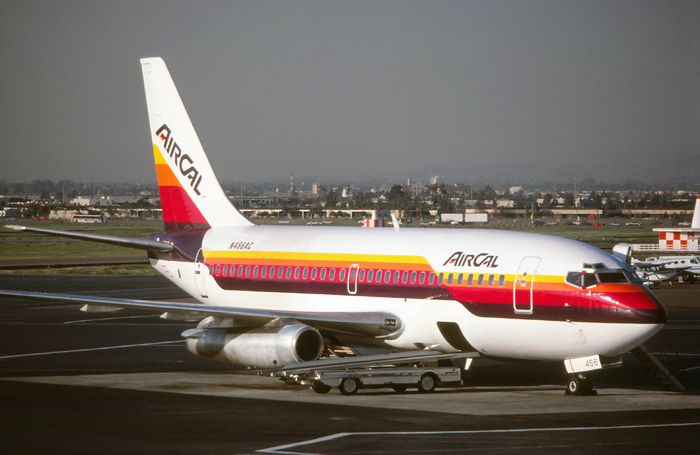 With various approvals received and stocks transferred American purchased AirCal on April 30, 1987. Although still operating as AirCal under its new parent of American Airlines, the airline started service to its last city, Long Beach with service from Orange County and San Francisco. This was the seventeenth and last city added to the AirCal timetable, before American Airlines officially merged the airline into its own operations on July 1, 1987. Air California started operations with a pair of Lockheed Electra airplanes for service from Orange County to San Francisco. With additional Electra's added to the fleet service was expanded at both Oakland and San Jose. Parked on the ramp at Oakland International Airport in September 1967, is N278AC, a Lockheed L-188 Electra-A, originally with American Airlines and delivered to Air California in November 1966. Air California leased two Douglas DC-9s during its initial foray into jet service in 1968. Parked on the ramp and awaiting its next load of passengers at Santa Ana-Orange County Airport in June 1968, is N8962, a Douglas DC-9-14, originally delivered to Continental Air Lines in May 1966 and leased to Air California on March 6, 1968. Air California received its first Boeing 737-200 in October 1968. The original four Boeing 737s were leased from GATX and used to replace the Douglas DC-9s and increase "jet" service from Orange County to the Bay Area. Seen on a pre-delivery test flight is N463GB, a Boeing 737-293, delivered new to the airline on October 7, 1968. The Boeing 737 proved to be the perfect choice for Air California to continue jet service along the Orange County-Bay Area routings and provide for future growth. Preparing to depart the ramp for a mid-morning flight at Santa Ana-Orange County Airport in July 1971, is N462GB, a Boeing 737-293. 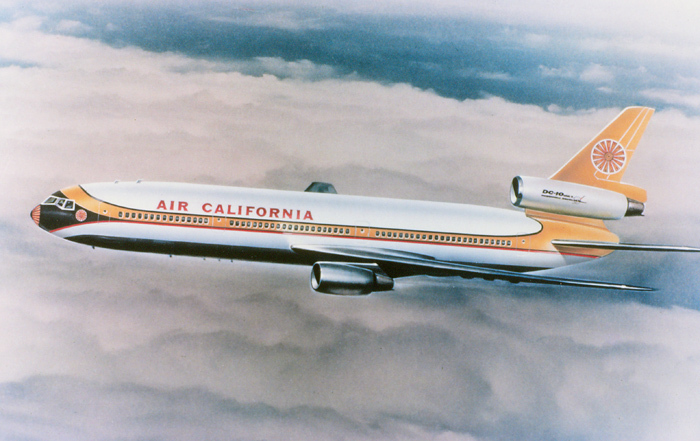 A fanciful representation of an Air California Douglas DC-10 produced by Douglas artists during the early 1970s. During the marketing of the new DC-10 Tri-jet, Douglas produced many "proposals" for airlines big and small. For a small intrastate carrier like Air California, the aspirations of a large, passenger airliner might have been worthy, but was never realized. A Lockheed Electra "Prop-Jet," is served and being prepared for another flight to Lake Tahoe on the ramp with its "Sunburst" logo and updated color scheme at Santa Ana-Orange County Airport in November 1977. Service to the mountain resort of Lake Tahoe, California became popular year round for those seeking recreational pursuits such as snow skiing in the winter and water sports in the summer. Seen taxiing off the active runway at Lake Tahoe Airport in June 1979, is N124AC, a Lockheed L-188 Electra-A, purchased when the airline acquired Holiday Airlines in April 1975. One of the second out of state cities that Air California received approval to start service to was Las Vegas, Nevada in September 1979. Awaiting takeoff clearance on Runway 25 at Las Vegas McCarran Airport in October 1980, is N469AC, a Boeing 737-293, delivered new to Air California on May 25, 1970. Air California was finally able to add Los Angeles, one of the last major airport in Southern California to be added to the expanding route network. Even with fierce competition the airline was eventually successful in the popular Los Angeles-San Francisco corridor. Being pushed back from Terminal 3 at Los Angeles International Airport in March 1981, is N464GB, a Boeing 737-293. 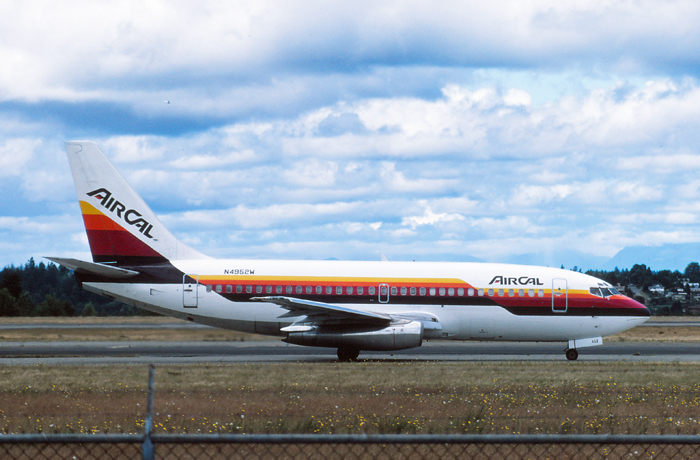 Air California became AirCal in April 1981, when the airline was purchased from Westgate Corporation by local investors. With the purchase came a total rebranding of the airline, including the introduction of a new color scheme which represented a "California Sunrise" signifying a new beginning. 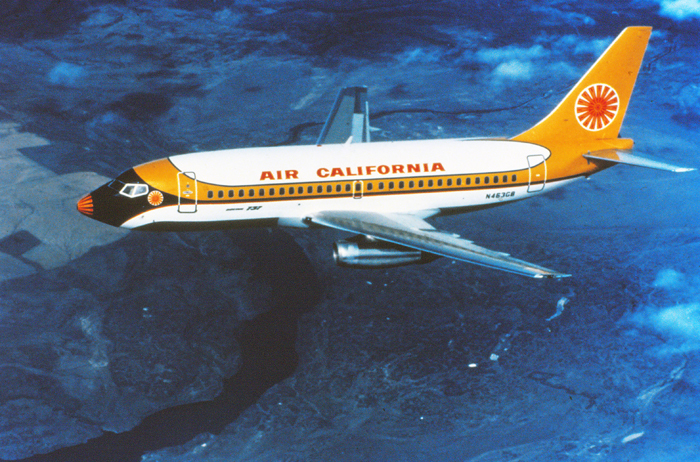 Wearing its new colors on a promotional flight over Newport Bay, California is N466AC, a Boeing 737-247, delivered in May 1980. Fresh from the paint shop and showing off its new corporate image in March 1981, during an evening turn-around at Santa-Ana Orange County Airport is N466AC, a Boeing 737-247. Reno, Nevada was the first location outside of California that Air California received approval to fly to and service was started in January 1979. Still wearing the "old" colors and taxiing toward the terminal at Reno-Cannon International Airport in July 1981, is N461GB, a Boeing 737-293, delivered to Air California in November 1968. 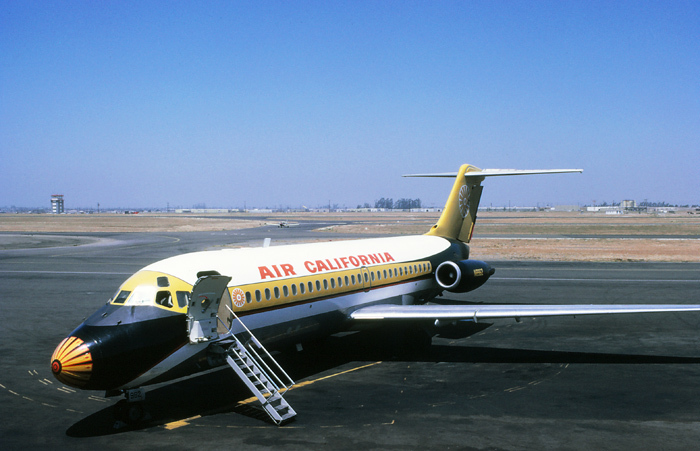 In an effort to better compete on popular intra-California routes as well as increase passenger capacity with a minimized noise foot-print, Air California order the McDonnell Douglas MD-80 in 1979. Seen on a pre-delivery test flight over Southern California is N478AC, a McDonnell Douglas MD-82 (DC-9-82), delivered new to the airline on October 21, 1981. 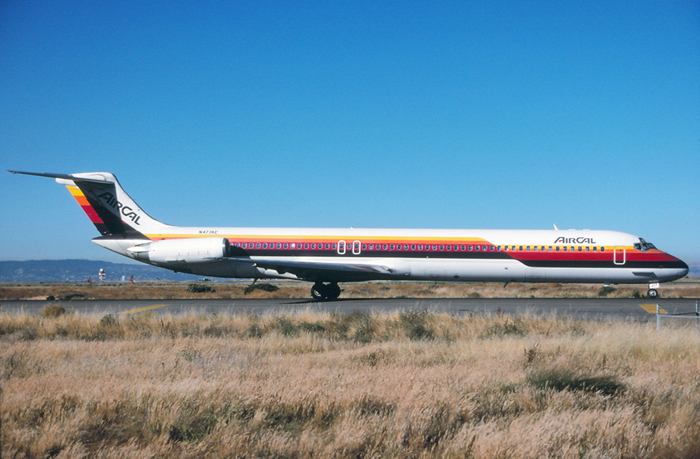 AirCal's first McDonnell Douglas MD-80 was placed into service on May 18, 1981 with flights between Santa Ana-Orange County and San Francisco. 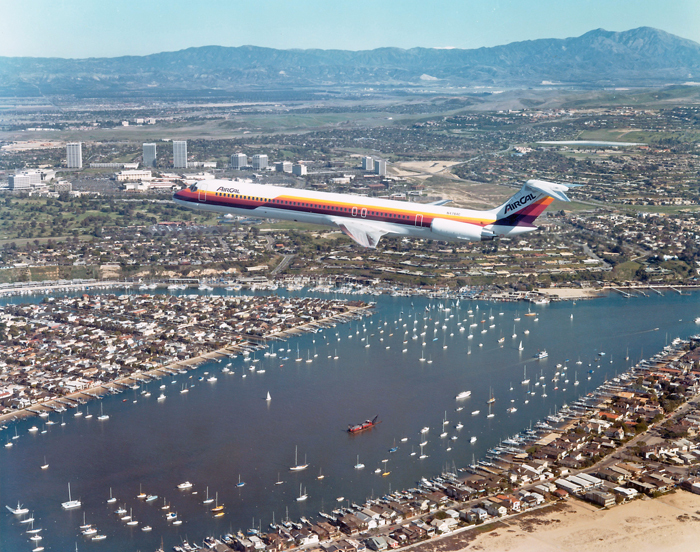 Framed by the Newport Beach Harbor and Fashion Island is N478AC, a McDonnell Douglas MD-82 (DC-9-82), on a promotional flight. The McDonnell Douglas MD-80s added needed capacity on some of the airlines more popular routes, however the new Stage III twin-jet could be seen at cities throughout the network. Parked on the ramp and awaiting a gate for a morning departure at Sacramento Metropolitan Airport in February 1982, is N475AC, a McDonnell Douglas MD-81 (DC-9-81), delivered new to the airline in May 1981. 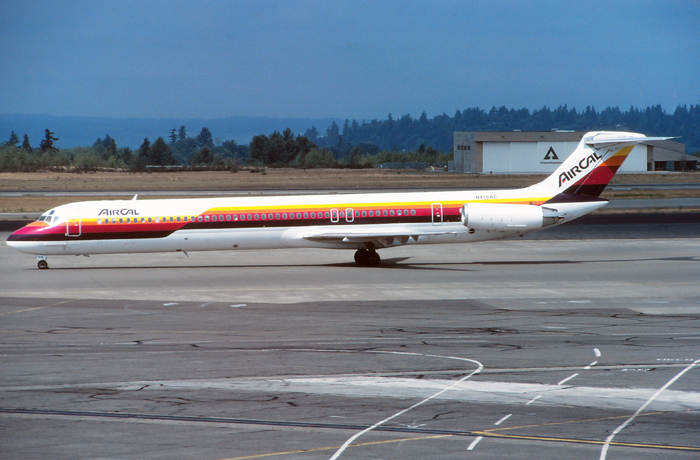 Seattle-Tacoma was added to the AirCal route map in November 1981, and opened up a new market to the Pacific Northwest. Taxiing along the outer apron inbound to the gate at Sea-Tac Airport in August 1982, is N476AC, a McDonnell Douglas MD-81 (DC-9-81), delivered new to the airline on June 8, 1981. 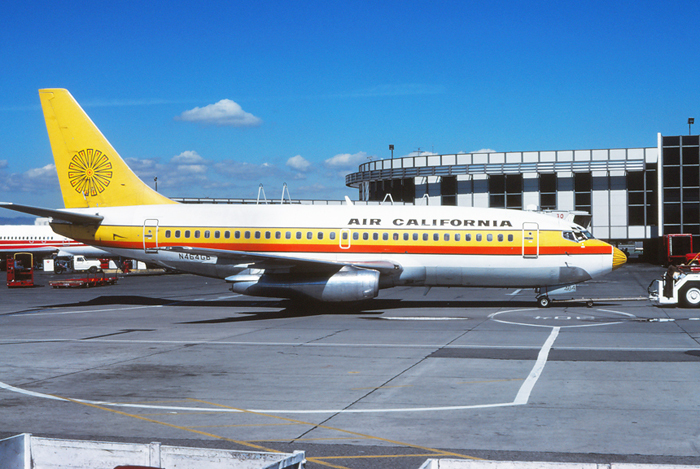 By the summer of 1982, AirCal was operating seven MD-80s and were using the 150-passenger aircraft on services from Southern California to the Bay Area and Pacific Northwest. Turning on to Runway 19 Right for an evening departure in July 1982, is N477AC, a McDonnell Douglas MD-82 (DC-9-82) delivered in October 1981. 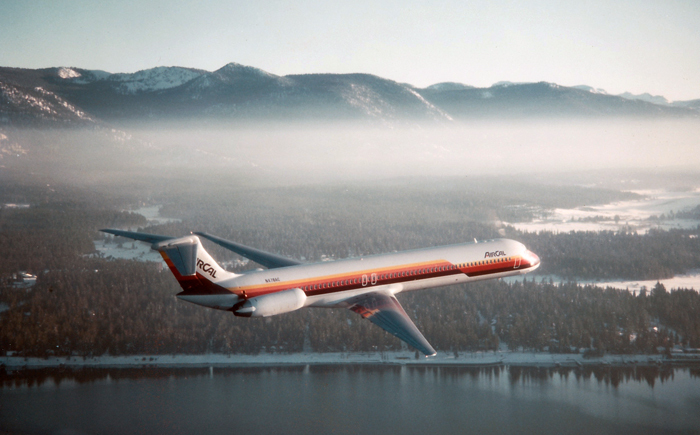 Lake Tahoe service was reintroduced in May 1983, using the McDonnell Douglas MD-80s on flights from Orange County and the Bay Area. Seen over Lake Tahoe on a cold winter morning is N478AC, a McDonnell Douglas MD-82 (DC-9-82). San Francisco was a focus city for AirCal and was one of the first cities the airline added in 1967. 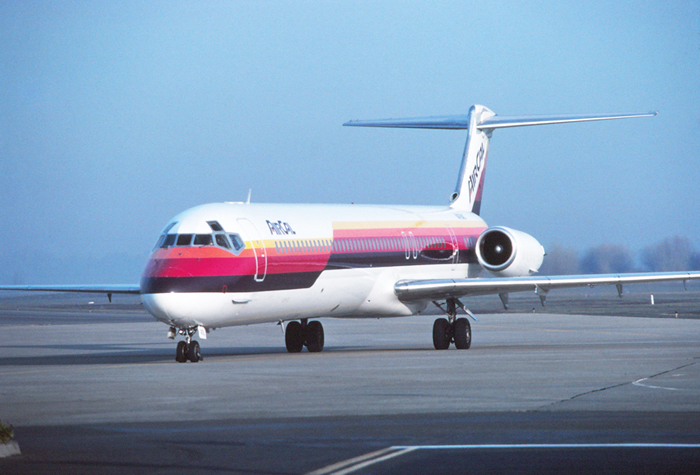 The McDonnell Douglas MD-80 was first put on service between Southern California and the Bay Area. Taxiing toward Runway 1 Right for an evening departure in July 1983, is N477AC, a McDonnell Douglas MD-82 (DC-9-82). Using newly delivered "next-generation," Boeing 737-300 aircraft, AirCal inaugurated its first international service to Vancouver, Canada on June 1, 1985. Taxiing out for takeoff at Vancouver International Airport in June 1985, is N308AC, a Boeing 737-3A4, delivered new on April 1, 1985. The new Boeing 737-300s were used to replace the McDonnell Douglas MD-80s and provide increased fuel economy on longer distance routes. Taxiing outbound for a morning departure at San Jose Municipal Airport in July 1985, is N307AC, a Boeing 737-3A4. In an effort to better compete with competitor Pacific Southwest Airlines (PSA) and acquire more slots at its hometown airport, Santa Ana-Orange County, AirCal ordered the ultra-quiet British made jetliner, the BAe 146. Holding for departure on Runway 19 Right at Santa Ana-Orange County Airport for an evening departure in February 1987, is N145AC, a British Aerospace BAe 146-200, delivered new in June 1986. During AirCal's growth spurt in 1985, additional "Classic" Boeing 737s were leased to provided needed capacity including this example, N4952W, a Boeing 737-210C, acquired from Wien Air Alaska and seen taxiing at Seattle-Tacoma International Airport in July 1986. 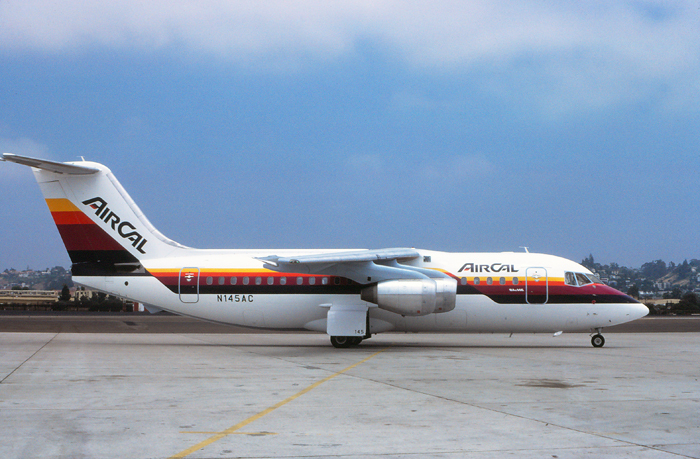 In April 1986, AirCal reintroduced service to San Diego, initially with non-stop flights to Orange County just 80-miles north using the new British made BAe 146 aircraft. 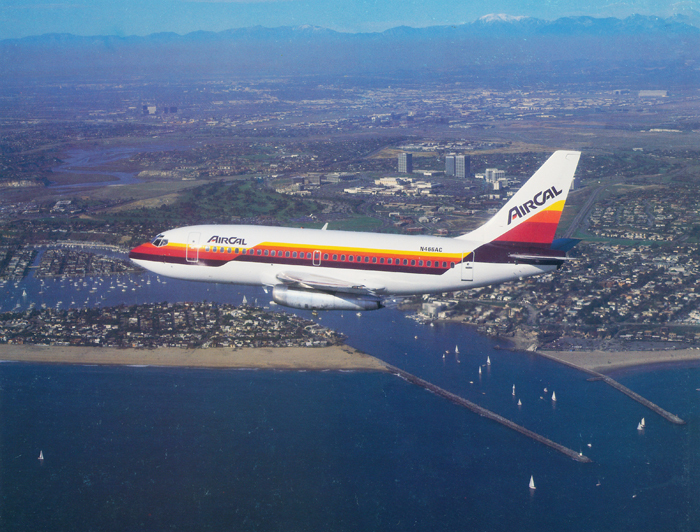 Having re-entered Pacific Southwest Airlines (PSA) territory AirCal was hopeful to establish a customer base with connecting flights through Orange County. Awaiting taxi clearance on the ramp at San Diego-Lindbergh Field in July 1986, is N145AC, a British Aerospace BAe 146-200, delivered new to AirCal a month earlier in June 1986. 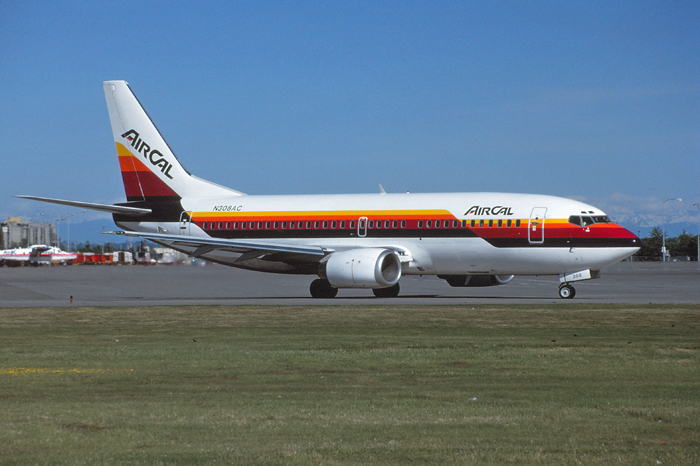 By 1986, the Boeing 737-300 was serving a majority of the routes in the AirCal system. Taxiing toward Runway 1 Right for an afternoon departure at San Francisco International Airport in October 1986, is N306AC, a Boeing 737-3A4, delivered new to the airline in April 1986. Burbank Airport benefited with the use of the ultra-quiet British made jetliners and allowed AirCal to acquire more slots at the noise-sensitive airport. Seen parked on the ramp during a turn around and awaiting passenger boarding at Burbank-Glendale-Pasadena Airport in October 1986, is N145AC, a British Aerospace BAe 146-200. 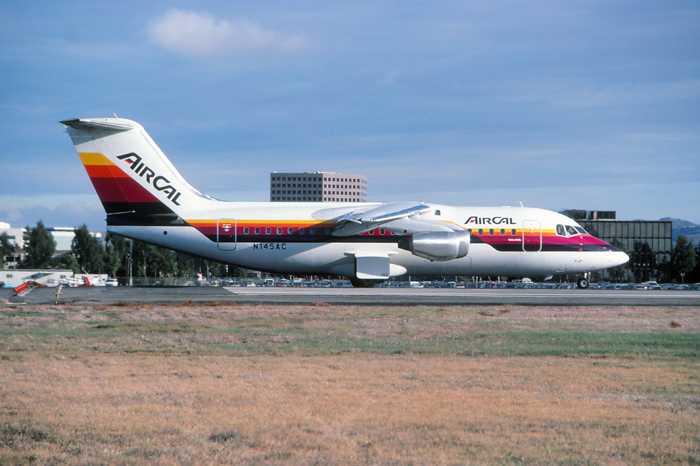 By 1987, AirCal was flying six BAe 146 aircraft and using the aircraft throughout the system especially into noise sensitive Orange County, San Diego, and Burbank Airports. Seen taxiing to out to Runway 30 Left for a morning departure at San Jose International Airport in February 1987, is N146AC, a British Aerospace BAe 146-200, delivered new to AirCal in July 1986.